Standing 605 feet tall, the Space Needle is not just for looking at - but it's a fun activity to explore with the family. 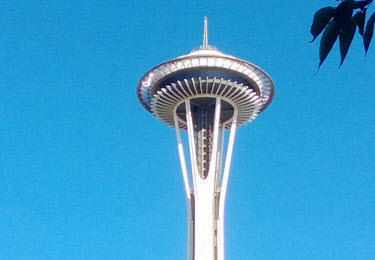 The observation deck at 520 feet has both a 360 degree outer section for an open outdoor view of the city, and an inside area where you can find Space Needle gifts for sale. The fun here is bringing your camera and taking lots of great photos.